One of many known “weak points” in the DeLorean is the RPM relay. You might think that with a name like that it would have something to do with the tachometer or the engine’s revolutions per minute – but no, that’d make too much sense for this car. 😉 This is a pretty custom relay with basically only one main a crossover to a Volvo unit that’s no longer manufactured (or available). Thankfully there’s a plentiful supply of spare ones made by DMC back in the day, and this old stockpile is still the most reliable New-Old-Stock stockpile available (in fact some Volvo owners order DMC ones). But that doesn’t mean it’s absolutely perfect. So what does it actually do? 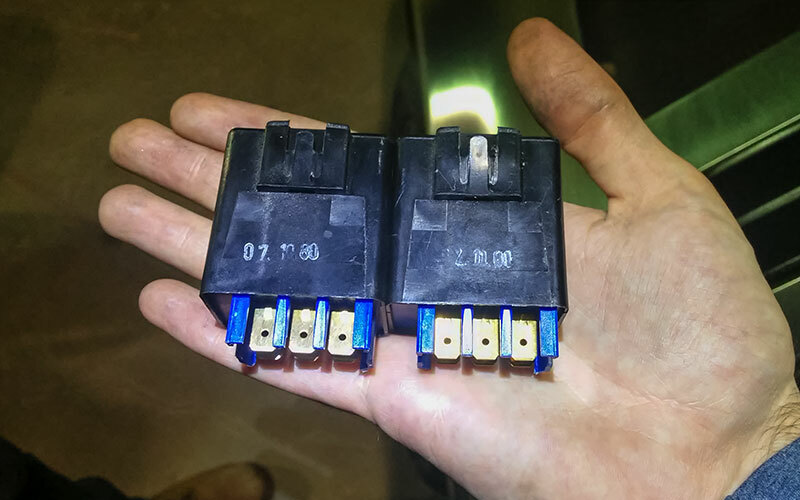 Basically, this relay is responsible for priming the fuel pressure when the car is being started, enabling the fuel pump when the engine is running, as well as providing power to the warm-up regulator when necessary. The problem is, this means you have a relay coil that is constantly energised the entire time the car is running – and if connectivity misses for even just a moment then you’ll lose fuel pressure and the engine will sputter at best (and die on you at worst). All relays have a habit of dying with time, particularly ones fitted inside DeLoreans. In particular, the fuel priming functionality is normally the first functionality to go as the electrolytic capacitor dies out over time, and if that happens the car simply won’t start. This relay fails often enough, is important enough, and is unique enough that many owners actually recommend you keep a spare in the glove box. 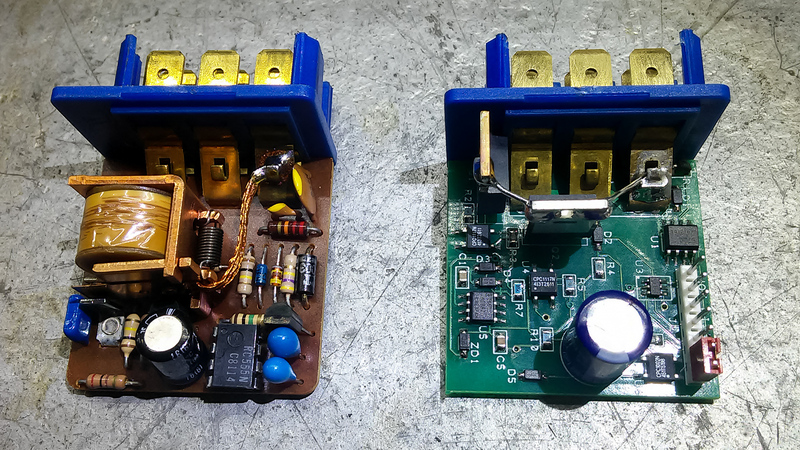 Fortunately, someone other than me saw this problem and went about rectifying it with a modern replacement – Enter Dave McKeen/Bitsyncmaster’s Solid State RPM Relay! …But on the inside, it’s clear that these are nothing alike! His replacement is amazeballs. It’s all solid-state so it’s far more reliable, it consumes a fraction of the power of the old one reducing both the load on the alternator and the heat generated inside the electronics compartment, it guarantees fuel auto-priming when starting the car every time & for the correct amount of time, it runs the fuel pump for half a second after turning off the car to boost your resting fuel pressure to help prevent hot start issues, and being a digital, microcontroller-based device it’s far better at handling dodgy signals from poor connections & old, corroded wires. What’s more, it comes with an optional feature you can enable using the jumper – the “hot fix” function which runs the fuel pump for half a second every hour for 3 hours after you shut down the engine, which helps the car start quickly again when the engine is hot if your car has trouble maintaining its resting fuel pressure. I don’t have that problem so I’ve left it disabled. You can buy an upgraded solid-state DeLorean RPM relay by emailing Dave McKeen/Bitsyncmaster; his details along with his other upgrades are on his website at dm-eng.weebly.com (but you may need to disable your Ad blocker to see his email address, it’ll get blocked by any “social” filters). So where can I get the solid state rpm relay? You can order them by emailing Dave McKeen/Bitsyncmaster; his details are on his website at https://dm-eng.weebly.com/ . You might need to disable your ad blocker to see his email (I had to, it’ll get blocked by “social” ad blocking filters).